For the auncient ceety, see Antioch. Location o Antakya athin Turkey. Antakya (Arabic: انطاكية‎, Anṭākyä frae Syriac: ܐܢܛܝܘܟܝܐ, Anṭiokia; Greek: Ἀντιόχεια, Antiókheia or Antiócheia) is an seat o the Hatay Province in soothren Turkey, near the border wi Sirie, makkin it the soothmaist ceety in Turkey. Kent as Antioch in auncient times, the ceety haes historical significance for Christianity, as it wis the place whaur the follaers o Jesus Christ wur cried Christians for the first time. The ceety an its massive waws an aa played an important role durin the Crusades. 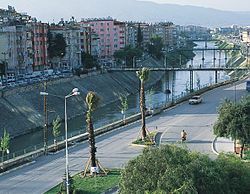 Antakya is locatit on the banks o the Orontes River (Turkis: Asi Nehri), approximately 22 km (14 mi) inland frae the Mediterranean coast. The ceety is in a valley surroondit bi muntains, the Nur Muntains (auncient Amanos) tae the north an Munt Keldağ (Jebel Akra tae the sooth, wi the 440 m heich Munt Habib Neccar (auncient Silpius) formin its eastren limits. The muntains are a source o a green marble. Antakya is at the northren edge o the Deid Sea Rift an vulnerable tae earthquakes. The plain o Amik tae the north-east o the ceety is fertile soil watered bi the Orontes, the Karasu an the Afrin rivers; the lake in the plain wis drained in 1980 bi a French company. At the same time channels wur built tae widen the Orontes an let it pass neatly through the ceety centre. The Orontes is joined in Antakya bi the Hacı Kürüş stream tae the north-east o the ceety near the kirk o St Peter, an the Hamşen which runs doun frae Habib-i Neccar tae the sooth-wast, unner Memekli Brig near the airmy barracks. Flora includes the bay trees an myrtle. The ceety enjoys a Mediterranean climate wi hot an dry simmers, an mild an wet winters; housomeivver due tae its heicher altitude, Antakya haes slichtly ceuler temperaturs than the coast.